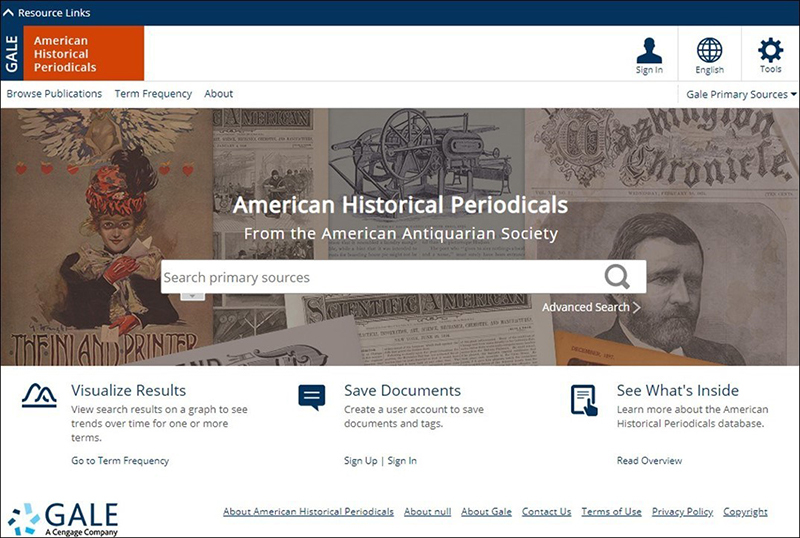 The American Antiquarian Society in Massachusetts has partnered with Gale, a Cengage company, in Farmington Hills to make its collection of Americana from the Colonial period through the 20th century more accessible to researchers. As part of the partnership, Gale has released American Historical Periodicals from the American Antiquarian Society, Series 6, a newly digitized series of nearly 200 titles that provides researchers with a history of the American people through the eyes of those who lived and experienced it. The American Antiquarian Society has the world’s largest collection of Americana. The new series includes unusual short-lived magazines and better-known titles with long runs. Topics cover agriculture, anthropology, art, archaeology, education, family life, fashion, industrialization, literature, medicine, music, photography, politics, religion, science, sport, and temperance. It fills gaps in about 45 titles from Series 1-5. Gale is offering free access to more than 6 million pages of American periodicals in Series 1-5 to any U.S. or Canadian institution that owns a Gale Primary Sources archive. Newly acquired titles in Series 6 include publications from the 1840s and 1860s, among others, while gaps were filled through publications from the 1840s-1910s, among others. All six series have been integrated into Gale’s new Digital Scholar Lab, allowing researchers to apply natural language processing tools to raw text data from the periodicals or Gale Primary Sources archives and perform textual analysis on large corpora of historical texts. The new series is currently available. Cengage serves higher education, K-12, professional, library, and workforce training markets worldwide, and Gale provides libraries with original and curated content, as well as modern research tools and technology. Gale has more than 500 employees globally.